Looking for a stylish Spanish name that could work well in English – but isn’t Sofia? 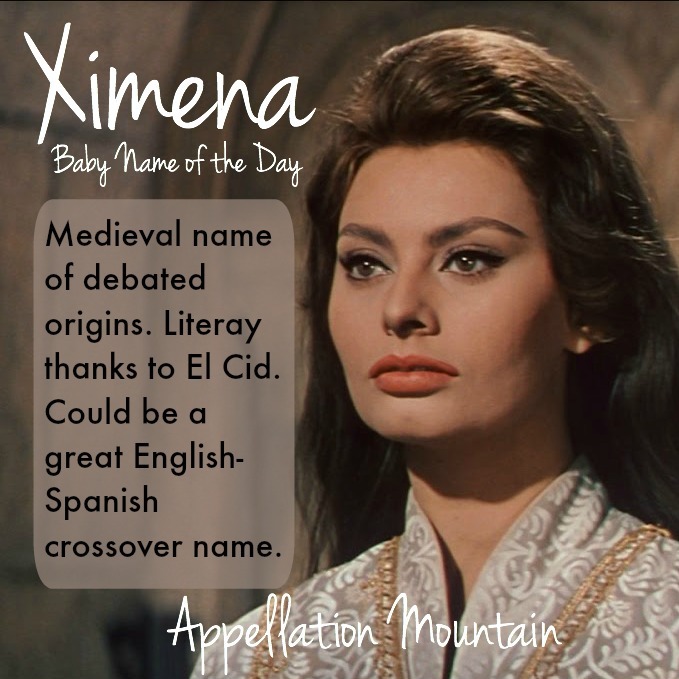 Thanks to Sky for suggesting our Baby Name of the Day: Ximena. 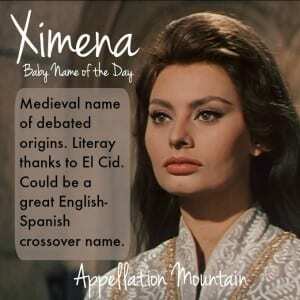 Ximeno is recorded as a given name by the eighth century, and Ximena appears around the same time. 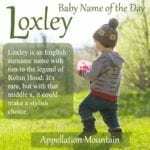 The question of the name’s meaning and origins is much more complex. 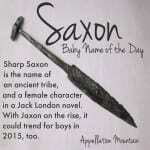 It could be a form of Simon, and Ximena is often listed with Simone. Other sources give a Basque meaning, from their word for son. Lastly, I found the suggestion that it was related to Maximus – drop the Ma. This seems like a stretch. The first person in the historical record with the name is the eighth century Jimeno the Strong. He may have been the father of Iñigo Aristo, ruler of Pamplona. One historical document refers to Iñigo as filius Simeonis – son of Simon. During the tenth century, the Jimenez family became the rulers of Navarre, in Pamplona. The surname comes from Ximeno I, though very little is known about him. The dynasty lasted into the 1200s. There are others, too, and the use of the name overlaps neatly with areas where Basque was spoken. My best guess is that Ximeno was Basque in origin, but has long been paired with Simon – though not always. In French, Ximena becomes Chimène – not Simone. More on that in a minute. Sometime in the late 1100s or early 1200s, an anonymous poet wrote El Cantar de mio Cid. El Cid was a nobleman falsely accused of wrongdoing and exiled. To restore his good name, he fought as part of the Reconquista – the reconquest of Spain from the Moors. He eventually became Prince of Valencia. It’s based on the life of Rodrigo Diaz. In both the real and fictional versions, his wife was Ximena. French playwright Pierre Corneille based his 1637 tragicomedy Le Cid, on the medieval poem. His Mrs. El Cid answered to Chimène. Did he invent the translation? I’m unsure, but the name has been used sparingly ever since. The 1961 movie version starred Charlton Heston as El Cid, and Sophia Loren as his wife, Chimène. El Cid remains a major figure in Spain. 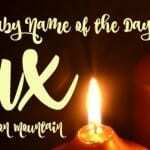 It’s no wonder that the name of his beloved is also remembered. Which spelling is right, Ximena or Jimena? Jimena is favored by the history books. Several of the medieval women with the name are recorded with the J spelling – but that seems to reflect a modern preference. In their lifetimes, they might have used either, or both. Some of it comes down to pronunciation. 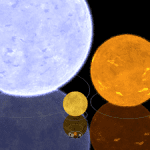 You can listen to Ximena here, with an H sound, as in Mexico – meh HEE coh. In the US, it’s no contest. Jimena ranked #423 in 2013. But Ximena came in at #162. Both names are rising, but Ximena is clearly dominant. We just love those high-value Scrabble letters, like X and Z.
Jimena might be mispronounced as Jim, but Ximena cues us that the sound is different. With the rise of Spanish as a second language in the US, more families are looking for heritage names that work well in English, too. Look no further than Isabella and Sophia/Sofia for proof. Ximena might be a choice that feels slightly more Spanish, but every bit as accessible in 2015. Do you think Ximena works well in English? Personally, I think it was originally a Basque name, that was ‘translated’ as Simon/a/e — like the Irish Ruaidhrí/Rory being ‘translated’ as Roderick/Roger.